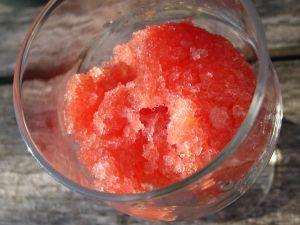 One of my favorite ways to use fresh strawberries is to make a strawberry granita. A granita is a type of Italian ice that you scratch with a fork to form delicious little ice crystals, a lot like a snow cone you'd get from a street vendor, but healthier. You can really use any fruit you like, and even spice it up with fresh herbs like basil, lavender, or lemongrass. Some people like to make an "adult" granita by adding in vodka, rum, or gin. Once you know the basic recipe, you can experiment to find your favorite granita recipe. This strawberry recipe is really easy to make and becomes a light and refreshing dessert for an afternoon snack or a delicious dessert on a warm summer night. Combine the sugar, water, and zest in a medium saucepan over medium heat. Bring to a boil and then reduce heat to a simmer. Simmer for about 5 minutes and then remove from the heat. Strain the sugar water to remove as much zest as possible, and then stir in the juices. In a high powered blender (I personally recommend the Vitamix), combine the strawberries with the juice mixture. Blend until nearly smooth. Divide the mixture into two 2-quart freezer containers and put in the freezer for about 6 hours. Every few hours through, stir and scrape the mixture to make sure it doesn't freeze into one solid block of ice. I find it's really helpful to set a timer because I almost always forget to check on the strawberry granita, and it's much harder when it's totally solid. When you're ready to serve, use the tines of a fork to scrape the granita until you can scoop the ice pieces into a bowl. Serve your icy granita with sliced strawberries and enjoy!